For this session I worked with a pack of Yorkies (Lilly, Grace, Mae and Daisey) who had no rules and were running roughshod over their guardian. She called me in when the newest addition to the group (Mae) started attacking Grace. Normally when I have a client with multiple dogs, I start out by suggesting adding in some structure to the dog’s day to day lives, but when I found out the dogs didn’t even know how to sit on command, I knew we needed to go back to basics. Because the dogs were rolling off one another’s energy, I had their guardian put three of them outside so I could work with one dog at a time. I showed their guardian who to use a hand motion to get the dog into a sitting position then immediately provided a high value meat treat and repeated the command word over and over as the dog chewed the treat. After a couple of minutes the dog was sitting on command so I showed the guardian how to transition the dog into a laying down position, then how to get it to recall on command. It took about seven minutes for the first dog. I had her bring in the next most difficult dog then repeated the process with her. The second time around the guardian’s timing and technique were better so I suggested that she apply the same technique to the other two dogs who were more accommodating. I stressed the importance of teaching the dogs these basics and practicing them every day for a week or two until the responses to given commands are immediate. You can’t expect a dog to listen, obey or behave if it doesn’t even know the basics. This simple obedience training will become the foundation of all later lessons, so its important that the dogs have them down cold. One of the rules I suggested was to make all furniture off limits as dogs often correlate their rank or status amongst the other members of the pack with how high they sit. In this case, the dogs sat on the couch at the same height as their guardian, and sometimes even higher; sitting on the top of the back to the couch. To help the dogs in the transition, I showed their guardian how to use high value treats to get the dogs to start using the multiple dog beds their guardian had provided. At first the dogs had difficulty finding the treats which is unusual as the treats I use have an extremely strong scent. I had to stop their guardian from pointing to a few of the treats and that probably illuminated part of the problem. This guardian was doing all the work for the dogs; lifting them up and down off the couch, going to where they were to pet or treat them, etc. By catering to the dogs to such an extent can actually handicap them. Why put forth any effort to find a treat when your guardian will do the work for you? Simply stopping this attention and connecting of the dots will cause the dogs to start to look for things themselves. This will allow them to gain confidence by discovering and accomplishing things on their own four legs. The tactic worked. Halfway through the session, one of the dogs went over to one of the dog beds and got in on her own, unprompted. One of the problems the guardian was experiencing was some over barking and fence fighting when a neighbor’s dog was in the yard next door. The guardian arranged for her neighbor to let the dog out so I could see the reaction. As soon as the dog saw the neighbor dog she started growling and barking trying to lunge at this much larger dog. I had placed the dog on a leash before the neighbor dog came out and showed her guardian how to use the leash to disagree and correct the dog. One of the keys is to disagree with the dog before its gets over excited. In order to do this, you need to monitor your dog closely right as it is exposed to whatever triggers it to react. In this case, the dog lowered its head and started to stare, then froze in place for a second before it started barking. If her guardian observes her closely and coordinates with the neighbor, she can practice correcting her dog before it starts to get excited. To help things further, I had the neighbor bring the other dog over into the Yorkie’s yard so we could introduce them without a fence between. For some dogs, the frustration of not being able to sniff another dog’s rear end can cause it to react. 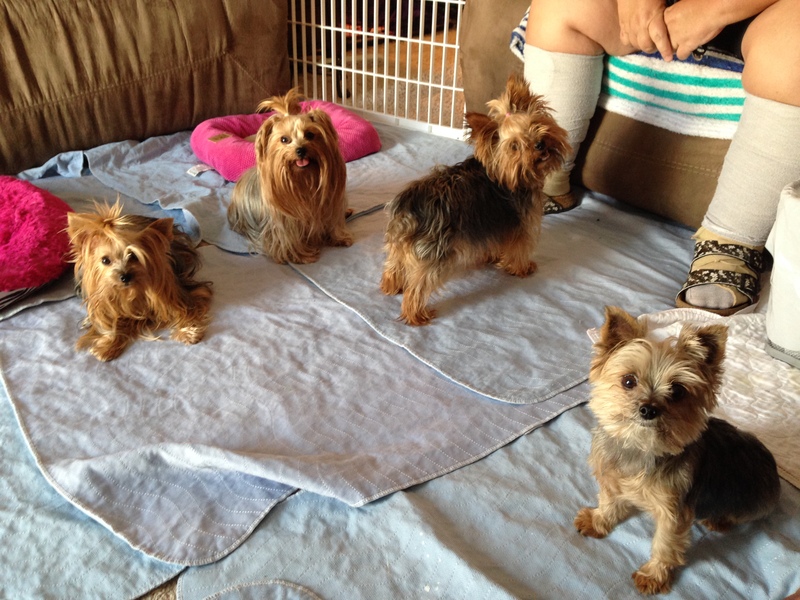 While that wasn’t the entire case here, introducing the dogs did help the Yorkie relax a bit. As you can see in the video, the Yorkie still leans a bit away from the neighbor dog which shows she is not completely comfortable. But the guardian was impressed the two dogs could be in the same yard together without fighting. But because I was in charge and disagreed with precise timing, the dogs could relax knowing that I wasn’t going to let anything happen. It is extremely important that the guardian reproduce this feeling of security so that the dog defers to her and stops reacting to unknown dogs. After going back inside, I showed the guardian how to claim her personal space. A small but important part of these dog’s rehabilitation. When a dog jumps or climbs up on top of a human, its a clear indicator that the dog does not respect the person. By simply claiming her personal space, the guardian can send a strong message to the dogs about the new boundaries they are expected to respect in the home. By the end of the session the dogs were much calmer. They were responding to the new non verbal body language their guardian was using and even following the newly introduced rules on their own. It will be crucially important for the guardian to continue to teach the dogs basic obedience and practice it on a daily basis. Combined with the new non verbal communication and structural changes int he home, this unruly pack of dogs will learn there is a new sherif in town, and she means business!